Caldwell’s sash window hardware range extends beyond our selection of conventional decorative and functional products. Alongside these ranges, we are also able to supply box sash window hardware, proving customers with hardware solutions for more traditional box sash window configurations. Box sash windows are vertical sliding windows nominally built using traditional hardware products. They are typically installed in period properties, or buildings located in conservation areas where traditional aesthetics are prioritised. Using either iron cast or lead weights, we manufacture and supply pulleys (two be used two per sash) for balancing box sash windows. Additionally, we can supply a range of traditional decorative hardware appearances to achieve the ultimate levels of authenticity. At Caldwell we have extensive experience supplying box sash weights and pulleys which are ideal for meeting heritage and listed building requirements. Depending on your performance and aesthetic we can supply pulleys in a variety of finishes from brass to polished or brushed stainless steel. We also offer two mechanical variations to ensure that our customers are able to cater for all box sash window applications, offering both axle and ball bearing type pulleys. 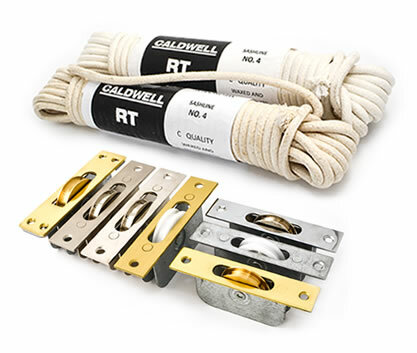 Our extensive range of traditional box sash hardware runs in line with our reputation for high quality products, and should you require it, Caldwell can supply recommended cutting sizes and deductions to give guidance on how to prepare and assemble various box sash configurations.